Mexicans are rightfully outraged at the extent to which corruption has been institutionalized in Mexico, and how it has exacted a toll on society that can be measured in everything from GDP to human lives. If the current political crisis is to have any positive impact in the long-run, it will be in how it reduces the ability of the political establishment to use the power of the state for the aim of maximizing its own private interests and those of the country's economic elites. Doing this, however, would be nothing short of a revolution in light of the long history of interdependence between the various beneficiaries of corruption. Yet there is a fantastic example in Mexico of how an institution was created that successful remolded the power of the establishment in one key aspect of democracy: the Instituto Federal Electoral or IFE, the federal electoral institute. Understanding how the IFE evolved from a government commission into an independent citizen-led organization could serve as a model for efforts to combat corruption, although there are reasons to believe that the task may prove more difficult this time around. When Nobel laureate Mario Vargas Llosa described the 71 years of PRI single-party rule in Mexico (1929-2000) as the "perfect dictatorship" he did so knowing that electoral success was essential towards maintaining the party's legitimacy in the eyes of the Mexican people. After all, if the PRI was to effectively institutionalize the ideals of the Mexican Revolution, it could not do so by replacing a dictatorship with another. This view was codified into one of the party's main slogans, effective suffrage, no re-election, which in practice became one of the most flagrant uses of Orwellian doublethink used in the 20th century. On one hand, suffrage was dominated by a system of patronage and corporatism which ensured that all major political interests in Mexico (businesses, unions, peasant groups) voted for the party in exchange for benefits such as subsidies or protection from competition. On the other hand, no re-election was enforced only in the sense of the individual but not the party itself, whose rule was perpetual. The 1988 elections became a watershed year for Mexican democracy as it was the first instance in which the system cracked. In that year, the PRI faced its first true electoral test from an amalgamation of left-wing parties that roused up enormous popular support among Mexico's educated, urban middle-classes that had grown tired of the PRI's economic mismanagement (the country was still reeling from the aftermath of the 1982 debt crisis) and authoritarian practices. When the initial results came in, the establishment panicked: the left-wing candidate, Cuauhtémoc Cárdenas (who would later merge these parties in to the PRD), was winning. The interior minister, Manuel Bartlett, went on national television on election night and declared that the computer systems "broke down" but that the PRI had won. Amid the ignominy of such blatant fraud, the wheels of democracy began to move. As it was in 1988, the federal government was in charge of organizing elections through a commission presided by the interior minister. Given that the party was inseparable from the state, what this meant was that PRI was essentially in charge of securing its re-election. But facing a severe crisis of legitimacy, the PRI had no choice but to accept loosening its control over the electoral mechanism and from this, the IFE was born in 1990. At first, the degree of political influence in the institution was still heavy but it was successful in organizing the "clean" 1994 elections which came with a few novelties, such as the first televised presidential debates. A series of subsequent reforms during 1993-96 transformed the IFE into a fully independent public institution, whose councilors and presidents were citizens, voted through a two-thirds majority in the Chamber of Deputies after being nominated by one of the main parties. In 2000 and under the leadership of its then president, José Woldenberg, the IFE organized the election that was to see a party other than the PRI obtain the presidency for the first time in seven decades. The IFE has had its ups and downs since then but has generally been viewed as one of Mexico's most trustworthy institutions despite some doubts over its impartiality. It was widely criticized, for example, during the 2006 election where the PAN defeated the PRD by less than half a percentage point at a time when none of the institute's councilors had been nominated by the PRD. It did not help that IFE president Luis Carlos Ugalde (Woldenberg's successor) also happened to be a personal friend of the winning candidate, Felipe Calderón. It has also come under fire for not being strict enough in punishing the parties for illegal campaign financing and spending. This accusation was levied quite strongly against the PRI in 2012, another election which was marred by allegations of fraud - this time mainly due to vote buying (which remains rampant as the recent gifting of television sets to welfare recipients ahead of the 2015 mid-terms shows). The less than stellar record of sub-national elections, which the IFE did not take part in, eventually led to its transformation into the Instituto Nacional Electoral (INE) as part of a 2013 political-electoral reform supported by all three of the major parties. But despite its shortcomings, it is impossible to deny the impact that the IFE has had in transforming Mexico's political landscape since the fateful 1988 elections and integrating citizens directly into the democratic process, so much that most Mexicans consider it an honor to be selected to organize their neighborhood polling booth (something akin to jury duty in the US). The fact that IFE voting cards are now taken as the de facto national ID is further proof of the institute's credibility. All in all, it is difficult to imagine how Mexico's democratic transition could have gone so smoothly without an effective electoral institute managing it. Can this be a model for an anti-corruption institution? Ironically, an anti-corruption institution was proposed by the government of Enrique Peña Nieto but unlike the structural reforms, this initiative has been stuck in Congress for the past two years. The events relating to the Ayotzinapa crisis and the "white house" scandal have forced the government to accelerate its anti-corruption efforts but only superficially: NGOs and non-partisan think tanks have lambasted Peña Nieto's ten-point plan (presented on November 27th) for addressing corruption, transparency and public security as being woefully inadequate given the task at hand. On December 9th, 32 of these organizations presented their own views on what an anti-corruption system should look like but like most other recommendations related to effective governance put out by civil society, it is likely to get ignored in favor of government-designed (and watered down) initiatives. Indeed, there are two reasons why the IFE model may not work when it comes to anti-corruption. First and foremost is the fact that the creation of an impartial electoral institute was triggered by pressure from a certain part of the political establishment that was unrepresented: the opposition. In this sense, the IFE did not erode the power of the establishment so much as it distributed it more evenly. In contrast, an effective anti-corruption system would benefit none of the parties since all of them benefit to a greater or lesser extent from the permissiveness of their rivals in tolerating rent-seeking activities. Tellingly, no major Mexican political figure has ever been convicted of corruption, something that stands in stark contrast with the experience of other Latin American countries including Brazil, Colombia and Peru (all of which, by the way, ranked better than Mexico in Transparency International's 2014 Corruption Perceptions Index released a few weeks ago). Even Guatemala, as close as one can have to a political basketcase in the region, has had an ex-president arrested over corruption (Alfonso Portillo) and accepted an internationally-run tribunal for processing corruption cases (the CICIG). Secondly is the fact that the Peña Nieto administration has no conceivable interest in setting up an effective anti-corruption system. 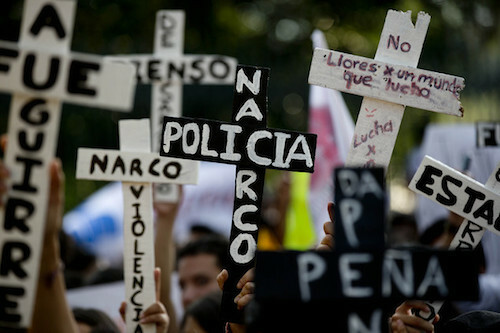 It cannot be expected to find a solution to the problem since it is a fundamental part of the problem: it is currently facing the most severe corruption allegations ever faced by a Mexican presidency so soon during the term (which as mentioned in a previous piece, would be grounds for impeachment in many other countries). Again, here lies another stark contrast with the experience of the IFE, which undertook its most important reform towards independence during the administration of Ernesto Zedillo, a president who appeared genuinely committed to decentralizing the Mexican political system, reducing the power of the presidency and establishing a legitimate electoral democracy even if it meant leading his party to its first loss in the polls (there have been no shortage of PRI members who have labelled Zedillo a "traitor" to the party because of this). Things of course, could change if social unrest intensifies or some other crisis erupts during the next four years that makes the government's inertia untenable; particularly if one of the two opposition parties wakes up to the fact that there are enormous long-term electoral advantages to be reaped if it takes a credible stance against corruption (starting, of course, within its own ranks). Unfortunately, none of this is likely to happen anytime soon. If change is to come, it will likely have to wait until after the next presidential election (2018) which I expect will be defined by the eventual candidates' moral credentials and their party's anti-corruption agenda more than anything else. Indeed, frustration against the "big three" (PRI, PAN, and PRD) could even result in minority parties and independent candidates having a meaningful impact for the first time in Mexico's short democratic history but expecting them to win still remains somewhat far-fetched. In the meantime, the dismal approval ratings given to both the ruling party and the opposition since the political crisis began suggests that the political landscape is not likely to change much in the 2015 mid-terms. For a long time, Mexicans have passively accepted a shocking degree of corruption under a misguided belief that the country just might be able to progress in spite of it, and because many ordinary citizens find ways of benefitting from it too. If the current political crisis is going to have any meaningful long term impact, it will be that the consensus view of the country's problems will shift inexorably from the economic back to the political realm. This new view will hold that Mexico's backwardness is not so much due to the fact that its energy sector is state-owned, or that there is no competition in the banking and telecoms sectors, but rather, because the country's institutions simply do not serve society and because the political establishment is, as one think tank director said recently, one of the most powerful cartels of them all. The question that now remains is whether this younger, more educated, and more politicized generation of Mexicans - who also happen to be armed with the awesomely disruptive power of social media - will be willing to wait so long for change to come.